A major challenge of using Whole-Genome Sequencing (WGS) for high-throughput genomic analysis is the amount of time required to perform the entire procedure from DNA isolation from the primary samples to analysis of the sequencing results. Fast next-generation sequencing requires the isolation of high-quality nucleic acids in a very short time frame and the optimization of the downstream pipeline. 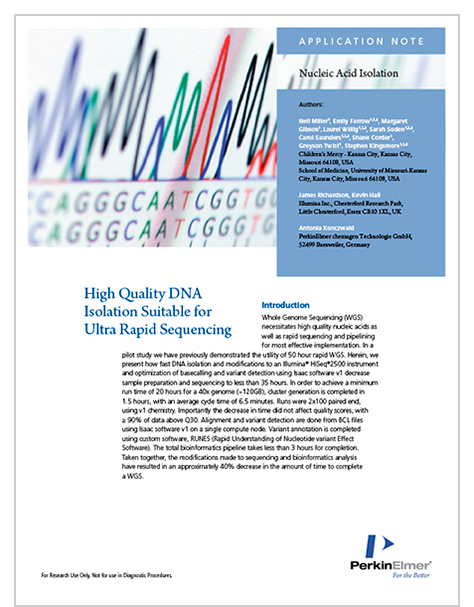 In the application note below, we describe how fast DNA isolation from high volumes of blood coupled to modifications to an Illumina® HiSeq®2500 instrument and optimization of base-calling and variant detection using Isaac software v1 can decrease the time from sample preparation to sequence analysis to less than 35 hours.